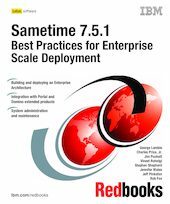 This IBM Redbooks publication provides a best practice framework for an enterprise-scale deployment of Sametime 7.5. It covers a range of business collaboration requirements that might typically be found within many large enterprises with geographically dispersed user communities and diverse business requirements for real-time collaboration. Specifically, we discuss how to plan, install and configure a Sametime 7.5 infrastructure that will scale to meet the needs of a large, globally distributed enterprise. We approach the installation and configuration of Sametime in deployment phases, beginning with implementing the community services (chat functionality) and setting up load balancing. We next implement the online meeting services. Building upon this infrastructure, we then discuss how to integrate Sametime functionality with other IBM/Lotus products, including Microsoft Office. Finally, we complete the environment by discussing aspects of security, administration, and recommended maintenance. Other topics covered in the book include a discussion of the Enterprise Meeting Server and the Sametime Gateway.